Sixteen-year-old Jackie Uy is a WriteGirl. She's a junior at L.A.’s LACES High School and wants to be an international correspondent, like Christiane Amanpour. Working with her Write Girl mentor, newspaper veteran Katherine Geyer, Uy has learned how to interview people, how to write a news story, and one other thing: confidence. Uy says you’ve got to have thick skin as a writer, "because you’ll get a lot of hate messages." Uy’s already had a taste of reader feedback as news editor of her school newspaper, LACES Untied. The First Lady praised a dozen after-school programs from around the country — and even one that works with street kids in Nairobi, Kenya. But she touted the singular success of Write Girl over the past decade, pointing out that "every single one of the program’s graduating seniors has gone on to college." 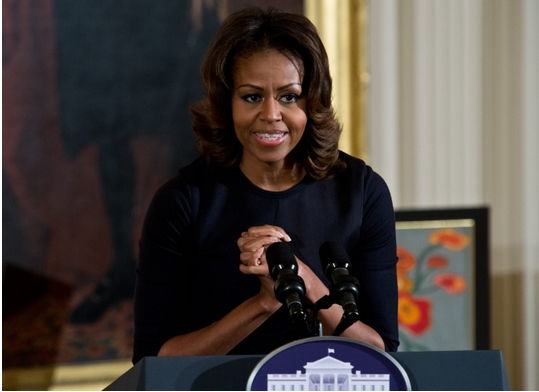 Mrs. Obama offered encouragement to the adults running the various after-school programs, saying, "all of you are using the power of the arts to change young people’s lives." The National Arts and Humanities Youth Program Award is the nation's highest honor for after-school programs. Those honored were chosen from a pool of more than 350 nominations. WriteGirl serves more than 350 teenage girls, nearly half of them Latina, many from families where English is a second language. Keren Taylor says she founded the organization in 2001 to help women writers — songwriters, poets, screenwriters, and journalists — find a place to share their skills. Taylor says the goal is to inspire a love of writing. "We call it literacy in disguise," she says. The kids think they're just in "a fun club," but they develop "a passion for writing." Write Girl mentor Katherine Geyer watched the ceremony from the press gallery in the White House East Room. She described workshops where the participants tell their own hard-to-tell stories that are published in an anthology. "I'm so excited our girls' voices are being heard here in Washington!"